Did you see the Ufo over Reading Berkshire England, on June 16 ? 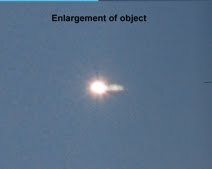 I stumbled across this interesting Ufo report at Earthfiles.com. This was taken @ 10:35 at night @200mm D80 DSLR using tripod. I still can't fathom out what it might be. It was quite a distance away, but not far enough for it to be a star. Not a lantern, object remained stable in location for 10 mins or so before slowly moving Northwards, and turning. I've had reports same object was seen from Dartford, UK @ 11:30pm last night. I also saw this, i believe it to be a metallic balloon.